The American Sycamore, Planatus occidentalis, has big dude leaves. It has a few little dude leaves too. 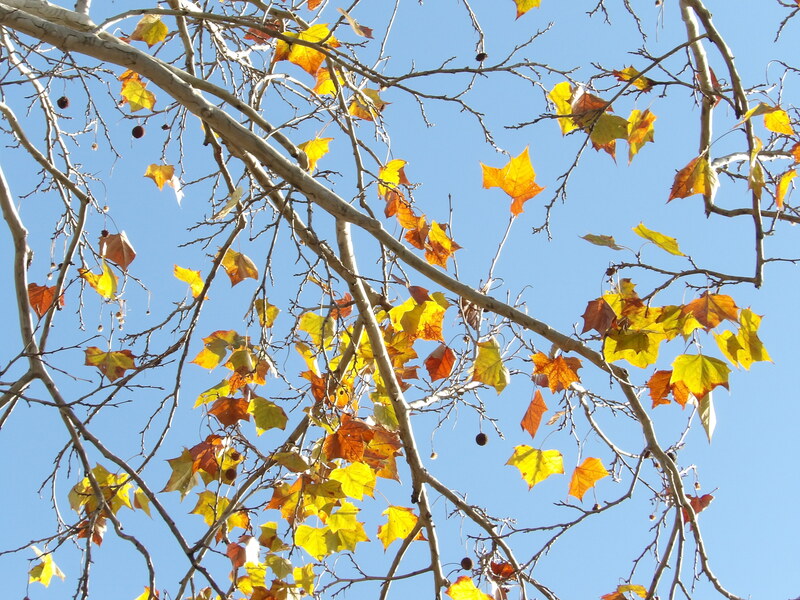 My Sycamore still hosts some leaves, both big and small, though most of its leaves are now on the ground. 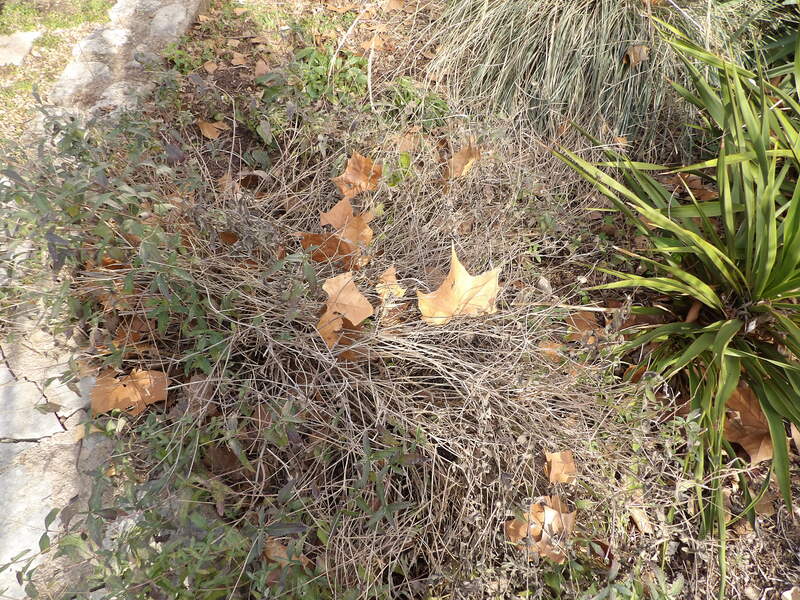 There are leaves over, under, and around shrubs, yuccas and all manner of plant material, as well. Some have sacrificed their all for the life cycle of the deciduous tree. In December’s Tree Following post, the Sycamore’s foliage had begun its autumnal color turn, courtesy of the slow down chlorophyll production and the visual uptick of carotenoid manufacture, but now that turn is essentially complete and leaf function for the tree is concluded for the year. 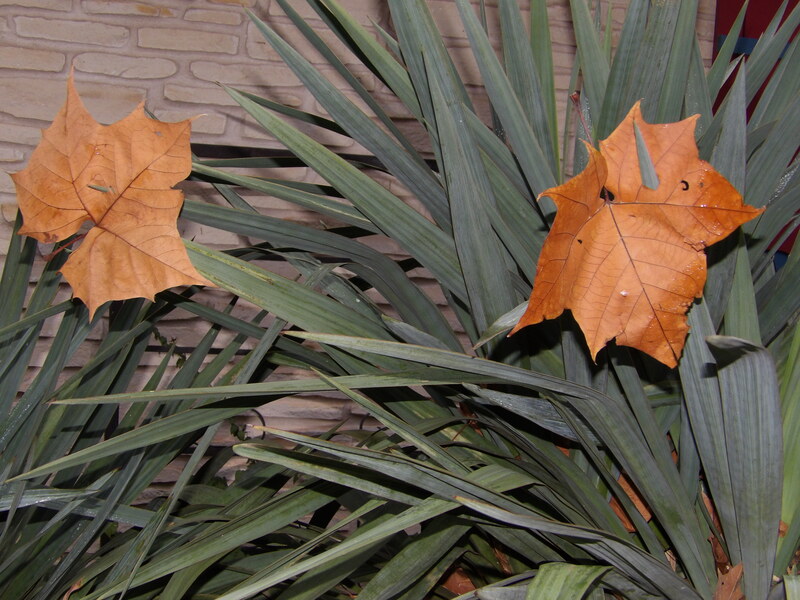 In botany, the process of leaf drop is called abscission. Leaf drop typically occurs in late fall and winter, mostly in response to the lessening of light, but also in response to colder temperatures. 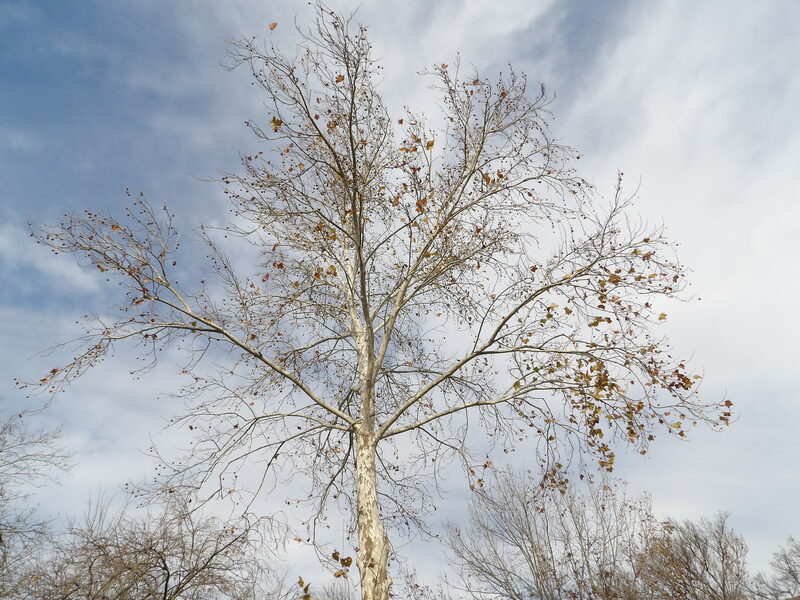 Abscission also happens during tree stress and, despite its native tree status, the American Sycamore stresses during the hot and dry Texas summer months, some years more than others. Many of these leaves dropped during July and August when our temperatures soared and the rain ceased. Except where I find them annoying (clustered ahead of the front and back doors, ready to hitch a ride on the dog’s fluffy tail or to get blown in with the slightest puffy breeze as the door opens), I allow leaves to stay on the ground to become leaf mold and to decay. That’s especially true in the wildscape part of my urban property which doubles as a work area. Leaf litter, as part of a wildlife habitat philosophy, is a good thing. Somehow in the past decades, American society was sold on the idea that leaves on the ground are bad and ugly and must be aggressively removed. With great fanaticism, we crank up the gas-guzzling blowers and mowers, add massive noise levels to all of our towns and cities, and spew fossil fuel exhaust into our world to rid ourselves of the offending masses of leaves. Whatever happened to using a rake? 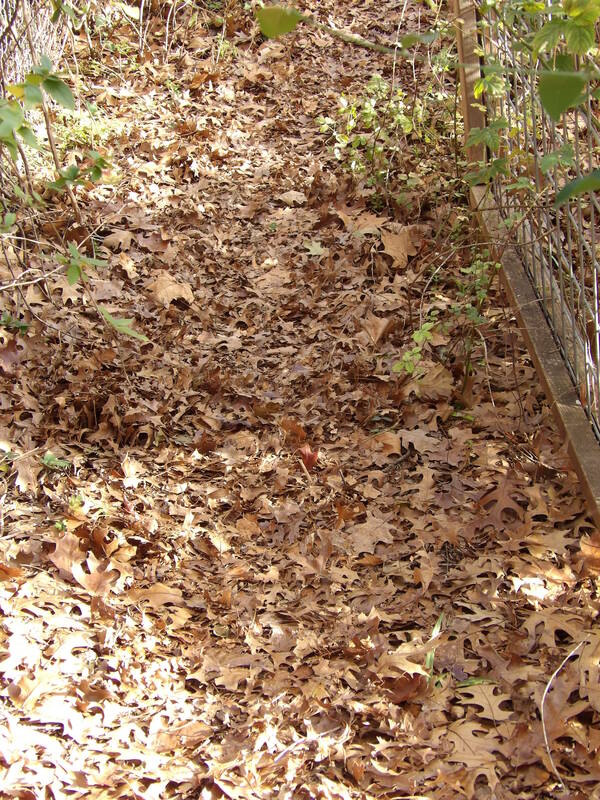 …but leaf litter serves as mulch, as protection for insects during winter, and a part of the system of biological breakdown–all good for those who make nature their home. As for the last of the leaves, especially the larger of the Sycamore beasties, I rake them up along with other garden detritus for yard waste pick up. No worries about garden “waste” being buried in a municipal landfill, the ex-garden stuff will be combined with treated sewage sludge and sold as a soil amendment. …so are the leaves on the tree. Though most are down, some of my Sycamore leaves hang tough. I expect the hangers-on to drop soon–today, tomorrow, this week–soon. Then all that will be left will be those dangly, decorative seed balls. Shall we count them? Perhaps that’s better left until next month. Many thanks to Pat at The Squirrelbasket for hosting Tree Following. Please pop over to her blog and learn what her tree and many others are up to for January’s Tree Following. 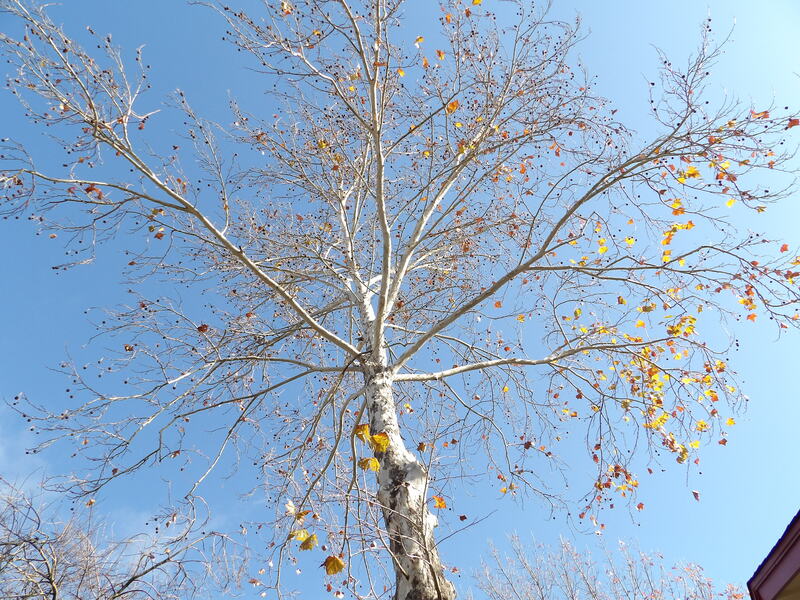 This entry was posted in American Sycamore, Plantanus occidentalis, Tree Following, Uncategorized and tagged Deciduous Trees by Tina. Bookmark the permalink. I’m with you. I like to keep the leaves in as many beds as I can. Luckily, I have a big natural area and any leaves I rake (with a real rake), I put around my trees which keeps the area moist in the summer. I never understand the vitriol against leaves that I’ve heard some express–goodness folks, they’re just leaves. I do admit that raking/tidying the leaves is one of my least favorite gardening jobs, but they’re good in gardens and compost. Something amazing about the outdoors! I have 3 American sycamores in my right of way strip. I love watching them change through out the year. I like the idea of leaving the leaves but they are so big and heavy that they suffocate some of my plants. We do collect them and compost them! Yes, Laurin I agree that the Sycamore leaves are SO huge. That’s really the reason that I started the shredding business. Those leaves take so long to break down. I also have Shumard Oak leaves–two trees worth–and they’re part of the BIG SHRED. Sycamores are lovely though throughout the year. 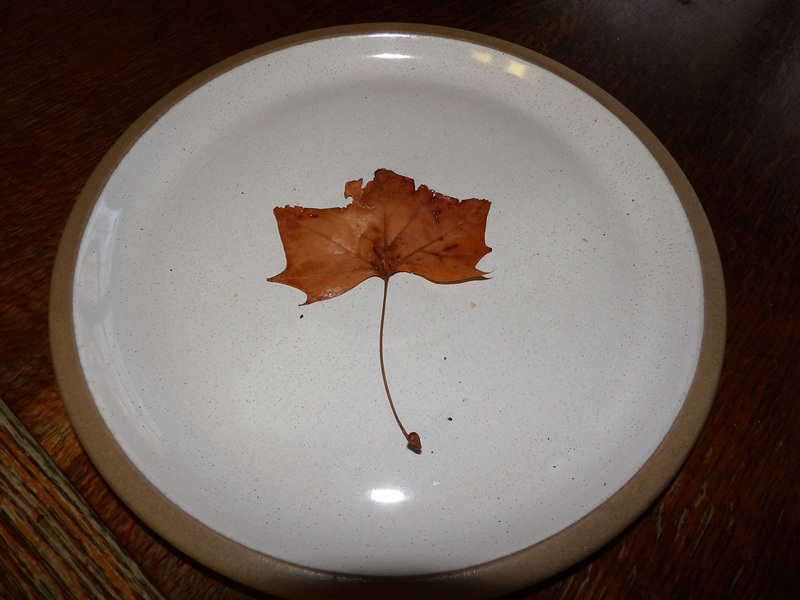 I particularly like those two pictures on a plate to show the scale of the leaves! Your garden looks so dry compared to ours this winter – although we leave the leaves to mulch on the flower beds, we like to sweep them up from the concrete of the yard, but haven’t been able to yet as it has been so very wet for a month or two, so every time we step outside the back door we are in mush. I look forward to seeing more of your sycamore – great tree. The Central Texas winter is one of gray/beige and very neutral colors. I haven’t experienced a freeze yet, so there are still some things blooming, but yes our winter palette is neutral. Are you where the heavy rains have been? I agree that the Sycamore is a great tree and thank you for bravely stepping in to continue this fun and informative meme. How lovely all the leaves! I too treasure the yearly harvest of leaves and realise how important they are in forming soil, potting compost and making everything fertile. I also love the beauty of them. Lovely write-up and photos. Thank you, Ms. Gaia. Leaves are so important once they’ve quit their job on the tree. I do think more folks realize the biological role that decaying plant matter plays, but it still bothers me tremendously to see bagged leaves going to the landfill. I think I can pin point just when people started hating leaves — when they started growing turf grass aka as lawns. I am just starting to see the logic or benefit behind the shape of a the sycamore leaf and the thickness of the magnolia leaf. Nature creates perfect designs with multi-functions. A couple years ago I decided to use the magnolia leaves as mulch around the tree. Last year I extended that ‘mulched’ area around the magnolia out much further — almost to the drip line. (Yes! That is a HUGE circle for an urban lot. That tree is more than 100 years old.) This fall when the rest of the land’s soil felt like powder to the touch, I pushed aside some of the fallen magnolia leaves and found that the soil there was moist and smelled alive! So yeah. Those magnolia leaves seem to never decay but their purpose is to protect the tree roots from drying out. I think you’re absolutely right. The whole sterile lawn, not a leaf out-of-place hedged…everything has become normative for American “garden” beauty. 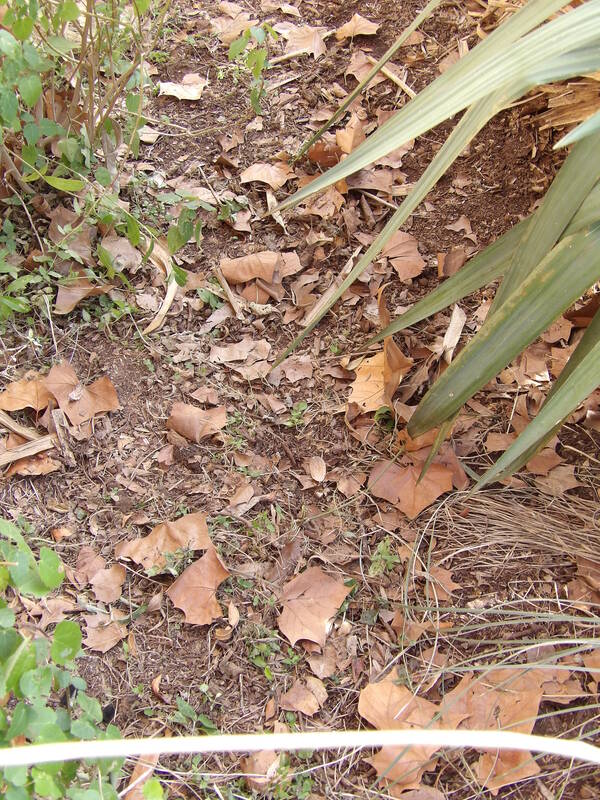 Fallen foliage is supposed to enrich soil and therefore, plants. It’s how nature works. I just wish it wasn’t such a hard concept for so many folks. Snort. That it is has survived our abuse for so long shows it must be some kind of superior being. I have learned SO much in the last ten years. What a great adaptation, to be able to drop leaves in response to stressful drought as well as at the end of the season. That’s a beautiful final shot of old leaves lit up by sunshine! Ha! We’d had a number of gloomy days and finally, one of those crisp, sparkly ones and I couldn’t resist the shot. Leaf drop during stress is a good adaptation, though I’m annoyed with the leaves on the back patio in hot, dry August. I love the leaf litter. It feeds the lawn when its mowed in and feeding the lawn feeds the tree so it makes more leaves. My excess leaves (that would suffocate the lawn entirely) go into creating soil in new garden beds. And then there are the thoughtful neighbors who bag their leaves and leave them curbside for me to nick in the night for my compost, mulch, and pathways. Rotting leaves are a garden’s and the gardener’s best friends. 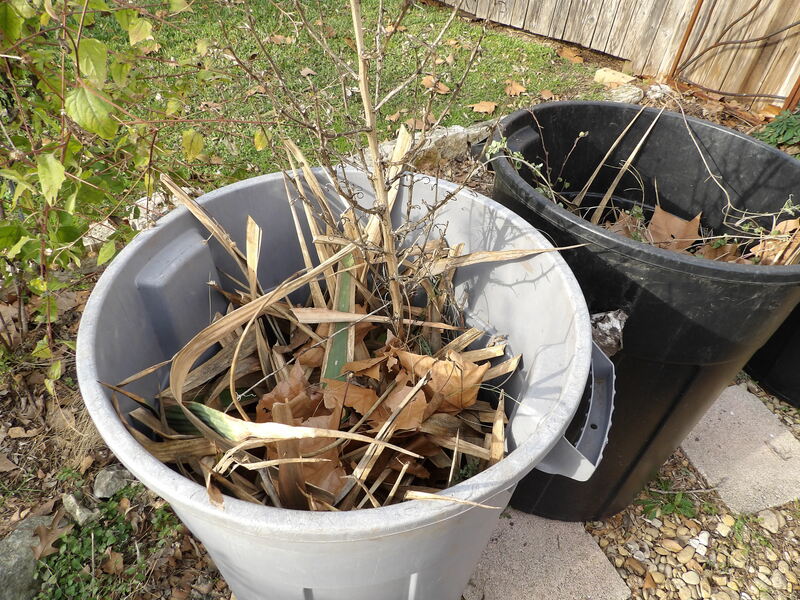 I’ve also benefited from the gifted leaves of neighbors and friends–a nice community effort! It bothers me greatly this craziness with non-sense noisy blowers, even used for tiny spaces! 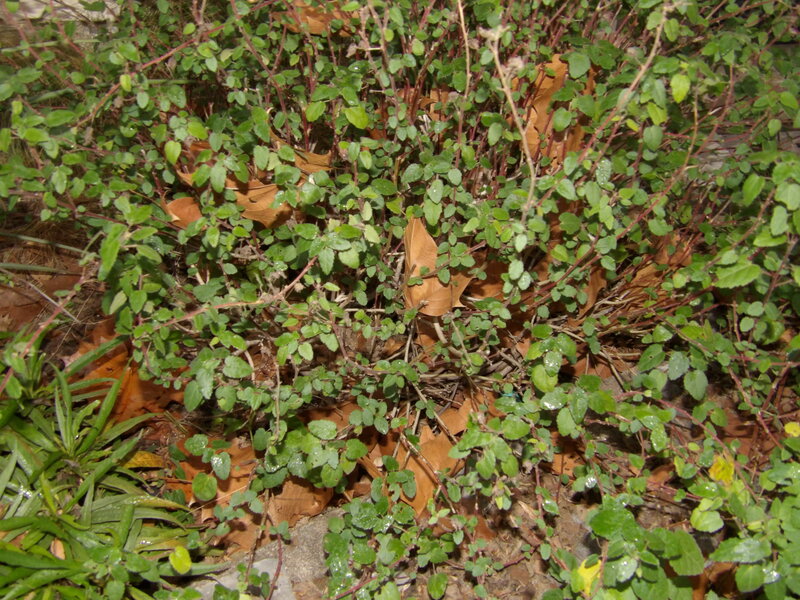 Not to mention of course that if not diseased, leaves are good to remain in place. Is it someone blowing away the leaves in the woods?, what do you think happened to them? – sometimes I ask this and people are looking at me with blank faces. Thanks! Don’t even get me started!! 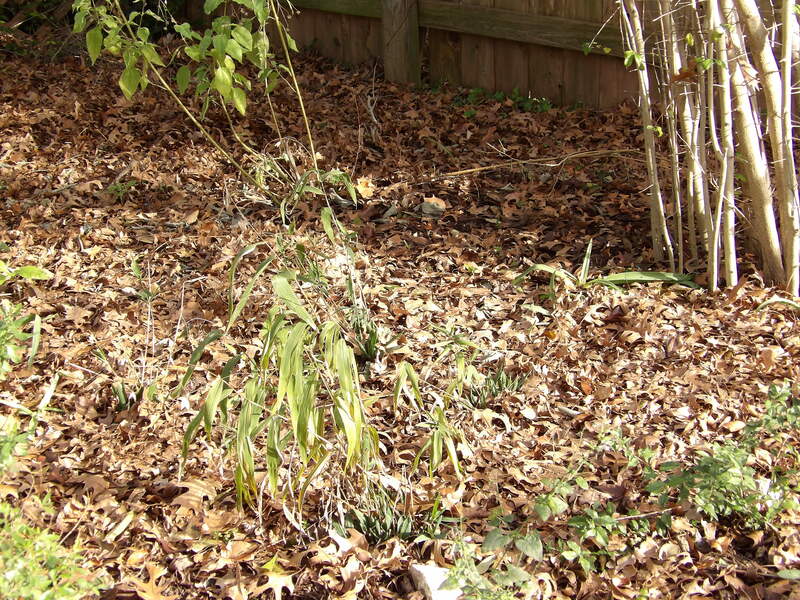 I’ve tried to explain that decomposing leaves on the ground/in a garden are akin to what happens in a forest. I might as well be speaking Etruscan for all that I was understood. 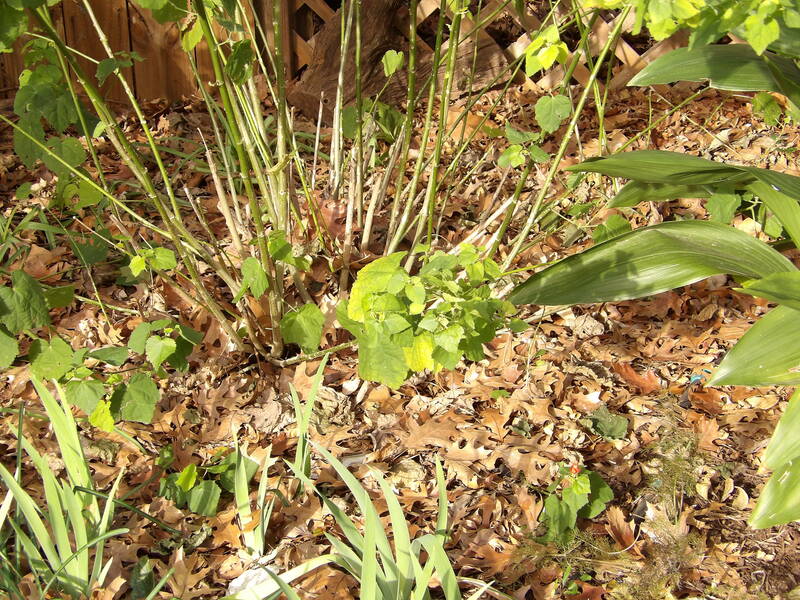 I agree with you regarding the leaf mulch–it’s excellent winter protection for perennials. Great post! Thanks, Beth–leaf mulch is boss! Man those trees look beautiful against a winter blue sky! The white bark gets me every time. Also, well done on leaving the leaves as mulch. 👏👏 You don’t see much of that near where I am. It’s very hastily bagged up and set out on trash day. Hi Jenn! Don’t the remaining leaves go beautifully with the sky?? And I agree that the bark is quite something–worth a post or two. There are plenty of folks in my neck of the woods who bag up too. The ones who really bug me are the “landscapers” (I think “scape” is the operative word there), who bag up with intention for the landfill. GRrrrrrrrrr. !